Taba (Arabic: طابا‎ Ṭāba , IPA: [ˈtˤɑːbɑ]) is a small Egyptian town near the northern tip of the Gulf of Aqaba. Taba is the location of Egypt's busiest border crossing with neighbouring Eilat, Israel. Taba is a frequent vacation spot for Egyptians and tourists, especially those from Israel on their way to other destinations in Egypt or as a weekend getaway. 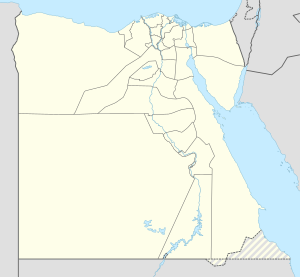 It is the northernmost resort of Egypt's Red Sea Riviera. The Taba Crisis of 1906 started when Sultan Abdul Hamid II of the Ottoman Empire decided to build a post at Taba. The British sent an Egyptian Coast Guard steamer to re-occupy Naqb el Aqaba and Taba. When encountered by a Turkish officer who refused them permission to land, the Egyptian force landed on the nearby Pharaoh's Island instead. The British Navy sent warships into the eastern Mediterranean and threatened to seize certain islands under the Ottoman Empire. The Sultan agreed to evacuate Taba and on 13 May 1906. Both Britain and Ottoman Empire agreed to demarcate a formal border that would run approximately straight from Rafah in a south-easterly direction to a point on the Gulf of Aqaba not less than 3 miles from Aqaba. Taba was located on the Egyptian side of the armistice line agreed to in 1949. During the Suez Crisis in 1956 it was briefly occupied but returned to Egypt when Israel withdrew in 1957. Israel reoccupied the Sinai Peninsula after the Six-Day War in 1967, and subsequently, a 400-room hotel was built in Taba. Following the 1973 Yom Kippur War, when Egypt and Israel were negotiating the exact position of the border, Israel claimed that Taba had been on the Ottoman side of a border agreed between the Ottomans and British Egypt in 1906 and had, therefore, been in error in its two previous agreements. 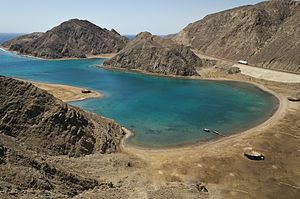 Although most of Sinai was returned to Egypt in 1982 following the 1979 peace treaty Taba was the last portion to be returned. After a long dispute, the issue was submitted to an international commission composed of one Israeli, one Egyptian, and three outsiders. In 1988, the commission ruled in Egypt's favour, and Israel returned Taba to Egypt in February 1989. As part of this subsequent agreement, travellers are permitted to cross from Israel at the Eilat–Taba border crossing, and visit the "Aqaba Coast Area of Sinai", (stretching from Taba down to Sharm el Sheikh, and including Nuweiba, Saint Catherine's Monastery and Dahab), visa-free for up to 14 days, making Taba a popular tourist destination. The resort community of Taba Heights is located some 20 km (12 mi) south of Taba. It features several large hotels, including The Hyatt Regency, Marriott, Sofitel and Intercontinental. It is also a significant diving area where many people come to either free dive, scuba dive or learn to dive via the many PADI courses on offer. Other recreation facilities include a new desert-style golf course. On 24 September 1995 the Taba Agreement was signed by Israel and the PLO in Taba. On October 7, 2004, the Hilton Taba was hit by a bomb that killed 34 people including Israelis. Twenty-four days later, an inquiry by the Egyptian Interior Ministry into the bombings concluded that the perpetrators received no external help but were aided by Bedouins on the peninsula. In February 2014, a coach taking tourists to Saint Catherine's Monastery in Sinai exploded in Taba shortly before crossing the border to Israel. At least two South Koreans were killed and 14 injured, the blast was blamed on terrorists. Despite warnings, tourism from Israel to Taba was up in 2016 with many traveling to enjoy the northernmost Red Sea resort. Taba heights' temperatures are slightly cooler and it has slightly more rainy days. It receives slightly less sunshine. Fjord Bay, a rare coastal shark breeding site, has been preserved and closed for tourists. Located just southwest of Taba is a 3590 km² protected area, including geological formations such as caves, a string of valleys, and mountainous passages. There are also some natural springs in the area. The area has 25 species of mammals, 50 species of rare birds, and 24 species of reptiles. ^ DK. DK Eyewitness Travel Guide: Egypt. DK Publishing; 2 February 2016. ISBN 978-1-4654-5320-4. p. 334–. ^ "Reports of International Arbitral Awards — Codification Division Publications". legal.un.org. Retrieved 2017-10-14. ^ Friedman, Thomas L.; Times, Special to the New York (1986-09-23). "THE TALK OF TABA; A DISPUTED SLICE OF SINAI IS TAKING IT ALL IN STRIDE". The New York Times. ISSN 0362-4331. Retrieved 2017-10-14. ^ "Death toll rises in Egypt blasts". BBC News. 9 October 2004. ^ "'No al-Qaeda hand' in Egypt bombs". BBC News. 1 November 2004. ^ "Sinai attacks: Deadly bombing hits Egypt tour bus". BBC News. 16 February 2014. ^ "Bus bomb kills tourists". New York Times. 17 February 2014. ^ Lifkin, Shimon B. (November 2, 2016). "Israeli Tourism in Sinai Up Despite Terror Warnings". Hamodia. ^ a b "Climate: Taba - Climate graph, Temperature graph, Climate table". Climate-Data.org. Retrieved 5 November 2013. ^ "BBC Weather - Ţābā". BBC Weather. Retrieved 5 November 2013. ^ a b "Taba Climate and Weather Averages, Egypt". Weather2Travel. Retrieved 5 November 2013. ^ a b "Taba Heights Climate and Weather Averages, Egypt". Weather2Travel. Retrieved 5 November 2013. Wikivoyage has a travel guide for Taba. This page was last edited on 31 March 2019, at 09:58 (UTC).